MXR M173 Classic 108 Fuzz Effects PedalGuitarists of all styles, from Hendrix devotees to garage rockers and stoner-metal fanatics, will dig the familiar late-Sixties/early-Seventies crunch delivered by the MXR M-173 Classic 108 Fuzz. Dunlop has taken the guts of the BC-108 loaded Fuzz Face, placed them in a more pedalboard-friendly shape, and added the modern conveniences of a battery door, optional AC operation, and true bypass with LED. The M-173 pedal`s Buffer switch eliminates the audible oscillation caused when some wah-wahs are placed in front of a Fuzz Face. 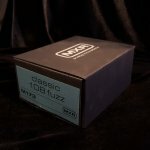 The Classic 108 Fuzz Pedal comes in a heavy-duty Phase 100-sized box with a sweet hammer-tone turquoise finish.MXR M-173 Classic 108 Fuzz Guitar Effects Pedal Features: * Pedalboard friendly * Optional AC operation * True bypass * LED * Heavy-duty casing * Hammer-tone turquoise finishGet the real fuzz sound you`ve been looking for. Order today.